In celebration of Canadian Men's Health week and Father's Day this weekend, I wanted to write something specifically for dads. Because what you say, do and eat matters, a lot! There is so much information out there geared towards moms and their influence on childhood feeding that I thought it was high time that we highlight your role when it comes time to shaping your child’s nutrition, health and weight. So let's cut to the chase; it's not the 1950s! Back in the day, research tended to focus on a mom’s role and influence on her children’s eating because moms were typically the primary caregiver. Fast forward to the 21st century and things have changed. Dads spend two-thirds as much time with their children as moms during the week and three-quarters as much time as mothers on the weekends. In a recent study, 50% of fathers indicated that they had a big influence on their child’s nutrition and were involved daily in the preparation of food and assisting with eating. Well done fathers! We cannot neglect the role that you play in influencing childhood eating and other outcomes. As with any role or responsibility we hold, it is important to reflect upon what is and isn't working in the role we hold. Unfortunately, much of the research around fathers' influence on childhood eating centres around the areas in need of repair. Let's take a quick look at what we know so that we can spend more time talking about what we can change and how fathers can re-write this narrative - as many of you dads perhaps already have! Dads approach mealtimes differently than moms. Dads: do any of these themes apply to you? If so, how is it affecting your child or the family unit? Perhaps you have made changes to one of these areas recently; if so, what changes have you noticed? Dads tend to use prompts, rewards, bribes and incentives to encourage children to eat. This probably doesn’t come as a surprise, but let’s be honest moms, it’s not just dads that use these tools. Prompts may be helpful if they are more nonchalant or ‘neutral’ prompts such as “don’t forget to try your chicken” vs. a physical prompts such as “eat your chicken and I will give you two scoops of ice cream” which we want to avoid. Unfortunately, in the research dads were less likely than moms to use neutral prompts and had fewer feeding strategies up their sleeves (i.e. fewer tools in their toolbox). Dads: are prompts or rewards/bribes your mainstay trick with your children? Or have you found other ways of promoting a positive relationship with food for your kids without turning veggies into the enemy and candy into the reward? Fathers' feeding strategies can directly impact their child’s weight status. There is a sizeable amount of evidence linking fathers' feeding practices and child adiposity or degree of overweight in children, such that a higher body mass index (or BMI) in children is associated with a greater restriction of food intake by fathers. One study in particular demonstrated that higher levels of body fat in daughters was associated with a higher paternal control in child feeding. Dads: do you have a son or daughter at home who is struggling with his or her weight? Are you trying to restrict or control their intake? Might there be another way to tackle the situation? Fathers' food choices might matter more than moms'! There is some early data from the Guelph Family Health Study (launched a few years ago in Guelph, Ontario, following 3000 families for 10-20 years) which reveals that dads dietary choices may have MORE of an impact than moms. Not that this has any scientific relevance but I can TOTALLY see this within our household! The number of times that the phrase "just like daddy" is used in my house in comparison to "just like mommy" is 100 to 1! Daddy is a superhero around here! Dads: your role modelling of healthy behaviours is actively soaked up by your children, even those little toddlers who you don't think might notice! Do you enjoy a variety of whole foods, including vegetables, at each of your meals eaten with your children? Do you model enjoyment of healthy foods? Or dislike? Who is the minister of health in your house? In our house my husband and I fill various “cabinet positions” to make our household run as smoothly as possible. Naturally, I was happy to assume the lead role of Minister of Health… but should that cabinet position be run only by “mom”? Likely not. If you skimmed what was discussed above, you will surely agree that this very important cabinet position should be shared between moms and dads, when and where there is the opportunity to do so. So dads, what do you think? Are you ready to help to shape a generation of competent eaters and healthy kids? Are you ready to take the next steps? First and foremost, take care of yourself. Eat well, be active and get rest. This is easier said than done but this models healthy behaviour to your kids. This is essential. Have an inaugural meeting of your cabinet ministers (whomever that includes!) and come up with a family health/nutrition/eating plan together! As Benjamin Franklin aptly put it "If you fail to plan you are planning to fail". Start positive eating and nutrition habits early; the newborn to 5 year window is prime time for you to show your kids what a healthy positive relationship with food looks like. Scale back on any negative pressure that you may be applying to eating in your home. Kids do much better when a positive framework is selected. 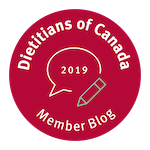 Add more “tools to your toolbox” by seeking additional resources from a registered dietitian who specializes in paediatric feeding and eating. Dads: what you say, do and eat matters - it matters a lot. And if our daddy is reading this, thanks for being such a great role model, especially in the kitchen and for your positive, affirming and encouraging words on the tough days. Thanks for showing our little troopers what it means to lead a healthy, active and balanced life. Khandpur et al. Fathers' child feeding practices: a review of the evidence. Appetite. 2014 Jul; 78:110-21. Khandpur et al. Diversity in fathers' food parenting practices: A qualitative exploration within a heterogeneous sample. Appetite. 2016 Jun 1;101:134-45. Guelph Family Health Study. Retrieved at: https://www.uoguelph.ca/gfhs/.